It’s a crazy idea, but heck, I admit it was sheer wicked and twisted fun watching the usually docile (and may I say dumb?) animals turn the tables on us humans, and start going on a berserk rampage to munch on our flesh. Watching them hunt in packs was surreal, and happens to be one of the nightmares of Henry Oldfield (Nathan Meister), who develops a phobia of our woolly friends after his brother Angus (Peter Feeney) played a cruel joke on him. The film fast forwards to the adult brothers, where the latter is planning to unveil his new “perfect” Oldfield sheep, and selling off the farm – why need the space when you can genetically engineer them? Before you say, oh this is yet another movie which warns about the dangers and questions the ethics behind tinkering with genetics, you would probably think again when it made the environmental activists folks look like social outcasts, and totally bumbling, indirectly contributing to the zombie sheep phenomenon. I liked how the problem became two- pronged, in that the sheep became infected of course, and how its bite is now its worst weapon. And I’d bet you’ll never look at another sheep, especially the baby ones, in the same light again, ha! The plot’s fairly straightforward to follow, with its villains (the scientists and of course, the raging sheep) and its heroes clearly spelt out – Henry, his farm hand Tucker (Tammy Davis), housekeeper Mrs Mac (Glenis Levestam), and an activist with an interest in Asian fengshui and zen sayings, called, check this out – Experience (Danielle Mason), who together actually form quite a lovable team whom you’ll root for to get out of this mess. With the animatronics and special effects done by Weta Workshop, you can expect some top notch gore, though I thought that despite it being a zombie flick, it lacked copious amounts of blood splatter. Chewing raw flesh may be stomach curling, especially when the details of such dastardly deeds are not spared, and the camera lingers. Transformational scenes were also fun yet eerie to watch, and if you think you’ve seen the best of these scenes from various werewolf movies, wait till you get a load from this one! Black Sheep makes no apology to its violence, sexual innuendoes or toilet humour. In fact, it celebrates them, to tragic-comedic effect. However it knew how to rein itself in, and the farting-sheep-shagging jokes never goes into overdrive. The acts of violence too had a fair share left to the imagination, though I thought there probably was some scrimping in expected chase and attack sequences. 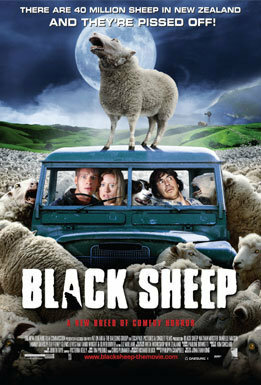 If you’re in for some light entertainment, then Black Sheep is probaaably your wicked choice for the week.